After Largemouths by Gabriel Delmas, a wordless opus of nearly 700 pages, Italian publisher Hollow Press tries a new editorial challenge with an eight-part saga created by an obscure artist, known only as Arallū. 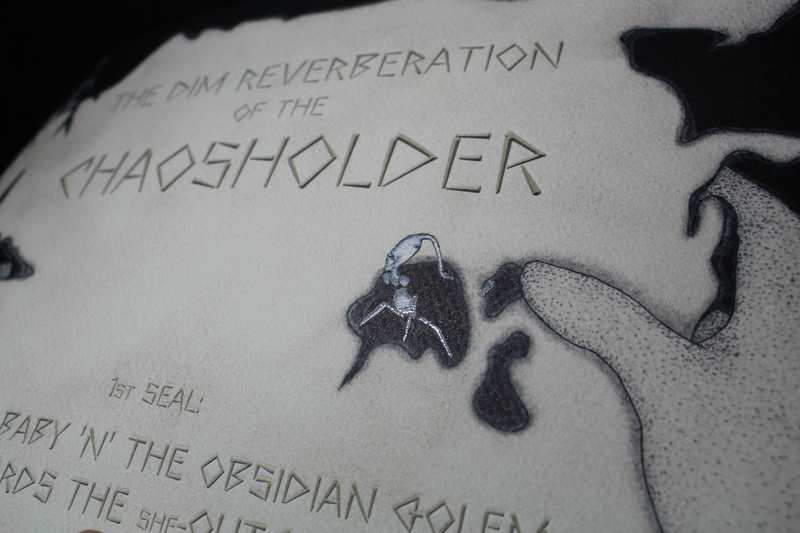 The first “seal” of The Dim Reverberation of the Chaosholder came out last January under the heading A Crippled Baby ‘n’ the Obsidian Golem, Towards the She-Outcast, confirming the inclination for long titles already highlighted by Under Dark Weird Fantasy Grounds anthology. Note: The book is on sale, like other Hollow Press titles, in the Just Indie Comics online store. I’ve also collaborated with the publisher for Paolo Massagli’s Toxic Psycho Killer. Presented by the publisher as a “dungeon crawler comic”, The Dim Reverberation of the Chaosholder is an alienating trip in an underground and diverse reality. This effect of claustrophobic derangement is achieved by Arallū through two basic narrative stratagems. The first and most obvious is the use of first-person perspective, similar to that of some shooter or fantasy videogames, which makes the reader one with the main character, the Obsidian Golem. The second is represented by the obsessive monologues of N’tar, a long-winded little monster who leads the Golem in the tunnels of the dungeon, carrying out the task assigned to him by the mysterious Hasabbāh. The reader is involved in a totally immersive experience, so that while turning the pages he can almost breathe the dust and humidity of the underground setting. He is essentially in the same situation of the protagonist, still silent, passive, able only to follow N’tar and to listen to his thick litany, full of singular words and of references to events yet undefined but probably essential for the development of the plot. The most intriguing seems the “Disorder”, an expression probably indicating an apocalyptic event of the past. Arallū doesn’t dwell on explanations but he takes us immediately in his universe, full of connections to mythologies certainly unusual compared to the common background of mainstream comics, as he looks to the East using Persian, Armenian, Turkish or Babylonian terms deliberately mangled: a good example is Hasabbāh, whose name is a crasis of Hassan-i Sabbah, head of the sect of the Assassins formed in Persia in the late 11th century and frequently quoted by William Burroughs. However, these elements aren’t enough to get an accurate connotation of the era and even of the world in which the story is set. But we know this is such a retrograde and dark reality that people are measuring the passage of time according to the regeneration of the wounds they inflict on themselves. The Dim Reverberation strikes not only for the story – full of text, intricated and intriguing – but also for the ability to join the Hollow Press vein, helping to give strength and cohesion to the catalog of Michele Nitri’s imprint. 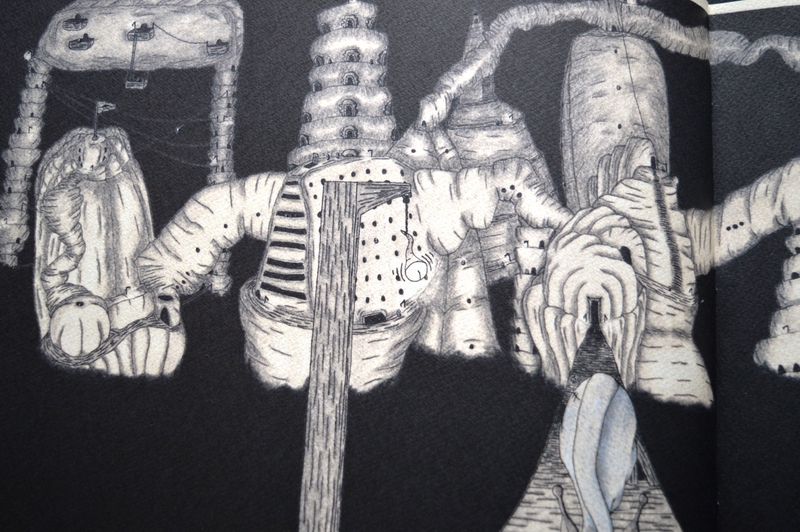 Here we find particular points in common with the work of Mat Brinkman and Miguel Angel Martin, the first for all his works but in particular for Multiforce – set in an underground world all of its own, although depicted with a more ironic and less solemn approach – the second for the story serialized in the Under Dark Weird Fantasy Grounds anthology, especially for the sexual subtext also present here with allusions to “fetishes” and “excitations of the anomaly”. Original, almost alien in the context of today’s indie and underground comics, the book confirms its singularity in the package. Stapled, in a horizontal format of 24 x 34 cm, it is in fact characterized by a high-quality 200 grams tintoretto paper and by the use of a translucent paint that enhances some details for every of the 32 pages of the book. The cover with the flaps is just another element that gives a truly remarkable elegance to the whole object. 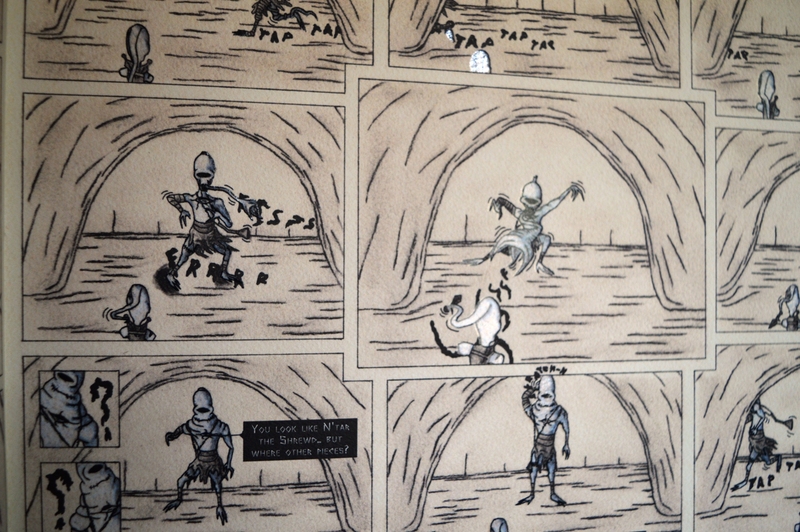 Inside the graphical approach is disturbing in drawing obsessively the desolate landscape of the dungeon and its weird inhabitants. 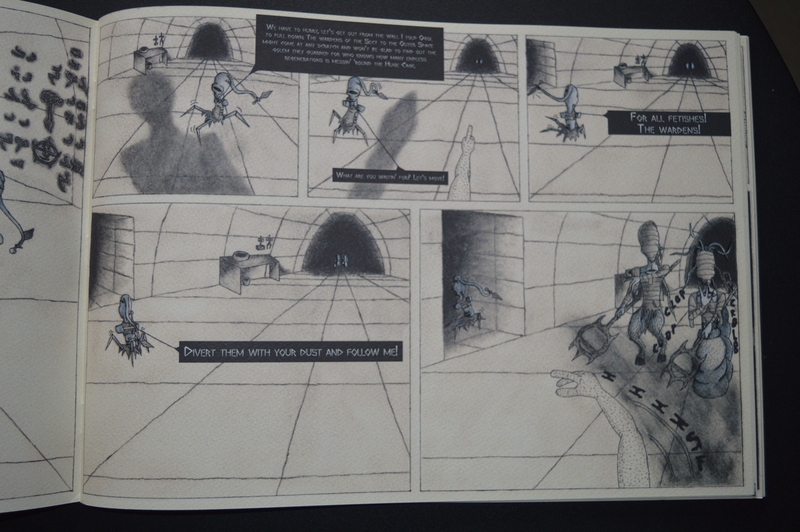 If some details, especially in the anatomy of the characters, are a little rough, the artist takes more and more confidence page after page, managing to build a style still basic but pleasantly unmistakable that culminates in the final scene, where the Obsidian Golem and N’tar meet the She-Outcast. Even the double-page reproduction of the Adwicked’s Creek is particularly successful and reminds Most Ancient’s Scaffold, a comic that for the mood and the nearly abstract drawings has some points of contact with The Dim Reverberation. As for other Hollow Press titles, the comic is published in English but this time there is an Italian and a Japanese translation included to give it a widespread distribution. And a huge diffusion would be really deserved, for courage, originality and ability to fit into an increasingly dense catalog, which now includes also three new books: Crystal Bone Drive by Tetsunori Tawaraya, Fobo by Gabriel Delmas and Tract by Shintaro Kago, debuting at the Toronto Comic Arts Festival next 14-15 May at the presence of both the artist and the publisher.